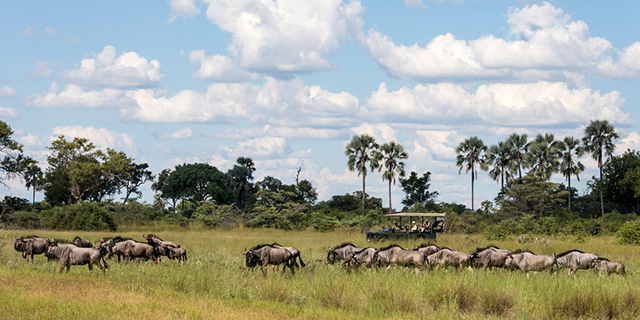 Seba Camp is located on the vast Abu concession, in the heart of the Okavango Delta. Seba benefits from its close ties with Abu Camp, the first camp in Africa to offer safari by elephant back and one of the most upmarket safari camps on the continent. Abu's high standards are carried over to Seba, as is the unmistakable importance of elephants to the overall experience at Seba Camp. 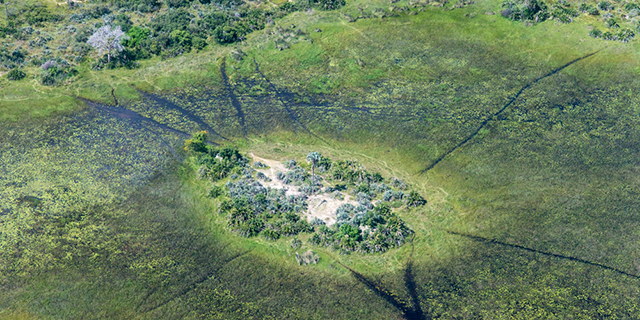 The 400,000 acre Abu concession provides a rich variety of habitat types, from open grasslands to wooded islands, floodplains, and papyrus-fringed channels. As the annual flood moves into the Delta, from April through September, the floodplains fill with water and Seba is a true combination land/water camp. When the flood recedes, vast grasslands replace floodplains and the focus moves exclusively to 'land' activities. Plains game abounds on the Abu concession, with large herds of zebra, impala, wildebeest, tsessebe, and lechwe often found feeding on the expansive grasslands. Giraffe are attracted by nutrient rich acacia trees on the larger islands, while the grazing species draw predators to the area - the concession is home to the full complement of Botswana's major predators including lion, leopard, cheetah, hyena, and wild dog. Research on the concession has shown that it harbors a disproportionate number of large bull elephants, a particularly rare demographic in most elephant populations as mature bull elephants with large tusks are ruthlessly pursued by ivory poachers who have decimated elephant herds in many parts of Africa. Birdlife is also abundant, adding color and beauty to an already majestic palette. Seba is a small, intimate camp, with only five tents spread across a wooded island and nestled into the natural vegetation. The camp blends seamlessly into the ancient hardwood forest of magnificent fig and leadwood trees, and is designed to take full advantage of the stunning views over the surrounding lagoons and floodplains. Common areas include an indoor dining area, several outdoor dining venues, a bar, a library, a cozy living room area, and a secluded swimming pool. The camp's simplicity creates a relaxed atmosphere that is enhanced by friendly yet highly attentive staff, excellent food, and outstanding attention to detail. Seba's luxurious en suite tented rooms are raised on wooden platforms and have private viewing decks overlooking the Okavango. Each tent is individually decorated to celebrate one of Botswana's cultural groups - the decor is simple and uncluttered, with a minimalist approach focusing on quality over quantity. The tents are creatively designed with large gauze "walls" to maximize airflow during the hotter part of the day, and canvas flaps that fold down at night to retain warmth. Seba is a family-friendly camp, with one of the best 'family units' of any classic level camp in Botswana. High quality guides are a feature of Seba Camp, and activities are many and varied. Game drives in specially adapted, open 4x4 vehicles are conducted in the early morning and late afternoon/evening, providing ideal opportunities for close up wildlife viewing. Walking excursions provide an even more intimate and interactive wilderness experience. 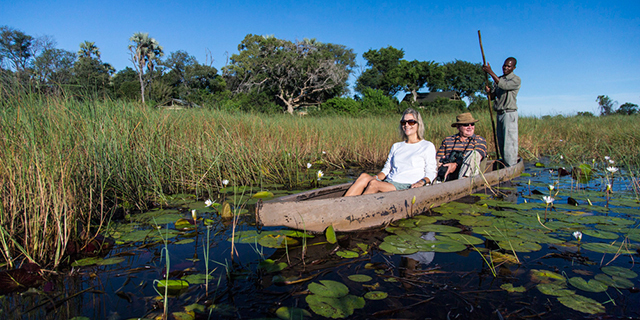 From April through September, Seba also offers boating and mokoro (dug out canoe) excursions on the lagoons and floodplains around camp. 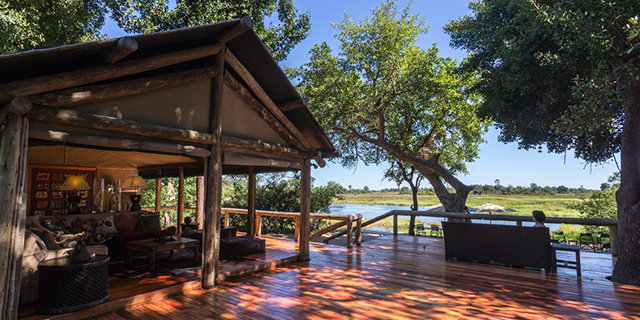 Seba Camp operates on the sound safari principle that "less is more". Fewer rooms, less fuss, and more focus on quality staff, food, and furnishings make for a camp that is simple yet sophisticated, friendly but efficient. 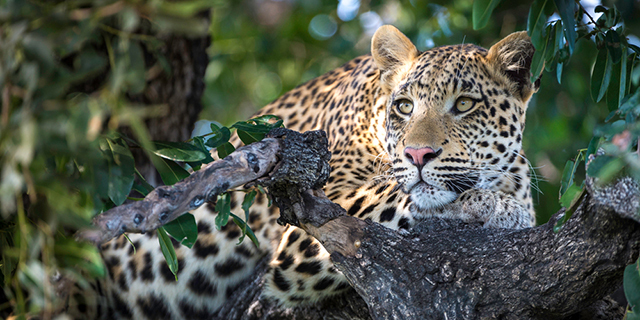 Seba enjoys a prime location in Botswana's famous Okavango Delta, with comprehensive representation of the Delta's abundant natural beauty and wealth of wildlife. Seba Camp is the base for an innovative research project being conducted by researchers from the Mammal Research Unit at the University of Bristol in the UK. The study's focus is the reintroduction of captive born/raised elephants into the wild, and the necessary conditions to maximize success rates. With elephant populations virtually wiped out by poaching across much of Africa, the possibility of reintroducing elephants to areas with suitable habitat is an exciting prospect for the future, but much still needs to be understood about the circumstances under which such reintroduction programs can succeed. By focusing on five elephants that have been released from the Abu riding herd, Dr. Kate Evans and her colleagues hope to learn more about the relations between local elephant populations and introduced elephants, and between the introduced elephants and their environment. The five study elephants have been collared so that their movements can be tracked by satellite, and their behavior monitored by researchers on the ground. Guests at Seba are offered the opportunity of accompanying the researchers as they track the released elephants and spend time observing them. Seba Camp is a Luxury Tented Safari Camp Located in Botswana's Okavango Delta.